The U.S. Postal Service’s contract with a union representing 200,000 employees expired on Thursday, but both sides agreed to extend their talks one more month to reach a new agreement. The clerks, mechanics, drivers, custodians and other workers represented by the American Postal Workers Union will remain covered during the extension under the benefits and protections of the existing collective bargaining agreement, which went into effect in 2016. The two sides began negotiating in June and did not give an indication as to whether they were closing in on an agreement. USPS said only that the extension was mutually agreed to. As negotiations were first getting underway, Dimondstein told Government Executive that APWU would not approach postal management with any “line in the sand.” He noted, however, that the union would not again agree to concessions included in a 2011 contract. That deal, which coincided with a significant downturn in the Postal Service’s finances, included two years of wage freezes, two years without cost-of-living adjustments, a new tier of workers starting at lower pay and facing a lower cap on their top pay, the establishment of a non-career workforce that paid less and provided fewer benefits, and a shift of health premiums toward employees. Still, he maintained APWU would enter negotiations with an open mind, willing to listen to any proposal put forward by postal management. He said his organization and the agency have an “honest relationship” and there are many issues on which the two sides are united. Dimondstein acknowledged, however, that significant differences remain and an impasse was possible. APWU took a new approach as it entered negotiations, namely by attempting to put service standards on the bargaining table. The union is attempting to negotiate over mailing standards, staffing levels and how late post offices must stay open, among other issues, Dimondstein said. If the two sides do not reach an agreement, they will enter mediation followed by binding interest arbitration. Both the union and management would present their arguments and an arbitrator would rule on the terms of the final contract. 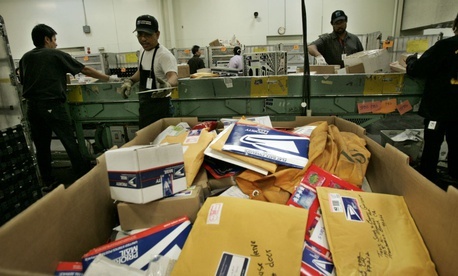 APWU and the Postal Service went to arbitration to settle their last round of negotiations. The National Association of Letter Carriers, which represents 213,000 postal workers, reached a voluntary agreement with the Postal Service last year to avoid arbitration. The union ratified the agreement with 94 percent of its members voting in support.